weej wrote: Wow, who'd have guessed searching for a way to make music work in a Need for Speed game would lead to a tiny chunk of my childhood memories! Long time lurker, first time poster - I signed up on Xentax a few days ago but NEVER realised the historic link till much later, Story Time!! Back in the early 90s In my country there was no concept of a game being legal or pirated, we just got whatever we got, we still paid money and that's how it was for years till the internet made the world a smaller place and we started learning of how things were done elsewhere! Back then the machine that enamored me the most as an 8 year old, was a Commodore 64. It was great! However anyone who owned a PC (of any kind , whether 80x86 based or c64 or amiga etc) would always wonder why the following companies were the only ones who made games for it: Razor1911, FairLighT, Groo, IKARI+TALENT (and a few others I can't remember) and the most prevalent one: BASH Presents (or maybe just BASH). It never occurred to me or my schoolfriends that these were cracking/reverse engineering groups - we actually thought they were the company creating and releasing the game! As we grew a little older we'd always discuss why these companies "didn't make the games as good as their introduction screens with all the fancy effects and text". or "How is it that these companies can pay so much attention to detail inside the game but the pretty intros have English written by a 5 yr old?" or "I just wish we didn't have to watch so many intro screens before actually playing the game!" One Game however stood out especially on the C64, that one was Turbo Outrun - its the one we all agreed on that actually looked as good as the intro screen and played just as well ! I got my copy of the game on floppy and for a Good 8 years at least, XentaX were the people who made the game! Why? Because when I'd run the game the first screen I'd get was a Turbo Outrun one but with the trademark weird English with a message and 'Greetz' and then it'd end with Xentax by Mr. Mouse. When you pressed space you'd get ANTOHER message with PRESENTED TO YOU BY XENTAX followed by a message that "Gordon/Gambino/Gambit (I dont remember!) was a fool". Then I'd hit Enter and the game's proper intro with run! Here's to another 25 years and beyond! I've got a similar background of playing on the C64, pirate cassette collections and the fascination with cracktros. Although, I've never encountered XeNTaX back in the day so I had no idea about their background. I've lurked on this forum for a while, first time poster. Just wanted to congratulate everyone on the anniversary. Btw, I suppose this is the message you mentioned, right? Been lurking since my last few posts, and I am glad to wish XeNTaX a Happy 25th Birthday! Haha that is GREAT! So many years ago and you still remember that. BTW MultiEx Commander download should work now and MultiEx Commander should also run. Sorry about the bug earlier. . .
Consequently, Gambit was really a fool. Just so you know. Mr.Mouse wrote: BTW MultiEx Commander download should work now and MultiEx Commander should also run. Sorry about the bug earlier. . .
Site subdomain now works, Thanks. But the Mail (with download link) is never sent, tried the different mails of mine. Of It's not automatical? @Mr.Mouse Finally! After 20 years I get to 'meet' the man who "made" one of my all time favorite games and made me listen to the first tune that got me into video game music. Because he made me listen to it TWICE before I could start the game! I can finally ask you questions like: "why didn't you make Jereon Tel, who clearly was part of your company called XentaX, put the theme song in the game itself?? or "Why doesn't Sega / US Gold put messages in their console games like on the C64?? What if Gambit made games on consoles and I'd bought it by mistake! Who'd want to buy from a fool?? "** etc. I even remember when we'd make up "facts" at school : "like you know that werewolf game on the NES is based on an actual story??" or "You know Xentax is Sega's European division, right? This is probably how Europeans roam around all day: in their Ferraris and mini dress wearing babes!" Being 8~10 was so fun...and insanely inaccurate. ** I know the reasons NOW, but back then these were valid questions dammit! 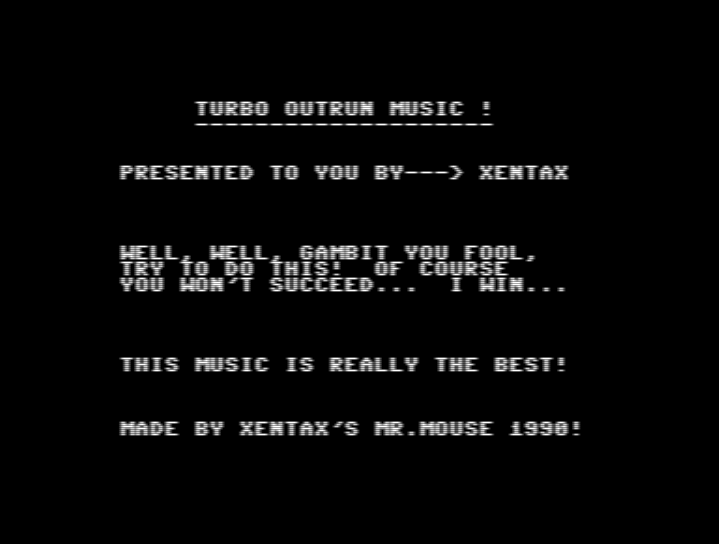 Hehe Just to be on the safe side here, but you do know now that XeNTaX did not make the Turbo Outrun game, right? I guess it must have looked like to an 8 year old that there were a lot of intro's before you could even start the game (but that were actually intro's written by crackers to show off their group and that they managed to crack that particular game). What country is that, by the way? As for the screen, that is from a demo, and I do not remember putting it in front of the game itself (I may have, but then that is lost in memory). If you would have the original file you refer to, I'd like to get it as well. I feel really stupid but I just can't get past the Captcha. Regardless of whether I try the audio or visual versions, it never accepts what I type in. It appears that FireFox hates the Captcha. Everything worked in IE. What country is that, by the way? As for the screen, that is from a demo, and I do not remember putting it in front of the game itself (I may have, but then that is lost in memory). Haha this is exactly what it was! The city/country I was in at the time (Dubai, U.A.E) wasn't even considered an option to sell games in by the actual publishers. Every game in the shops, no matter what the medium be it cartridge or floppy, was pirated. And I totally understand if you didn't add this to a game - almost everyone I've talked to from the C64 scene don't know of "BASH" for example, yet I messaged a childhood friend after years and he totally remembers their intro before you could run the game itself! Since piracy was huge there (and to be honest, it's STILL huge where I am now - hello from Sri Lanka btw!) I assumed these shopkeepers just took appropriate intros from wherever they could find them and then slap them onto cracked games and sold them. They pirated from the pirates (and the demo scene) ! From a marketing point of view it worked well since a LOT of demos/intros would be put up on display to sell computers (this, for example, is how I was introduced to the Unreal demo by FutureCrew and Crystal Dreams II by Triton..they were played on a, at that time, amazingly fast 486 DX2-66Mhz - which was placed in showcase windows so passerby's could see it! If you would have the original file you refer to, I'd like to get it as well. Sadly I no longer have any of my original floppies or the C64 anymore either since I've shifted countries. Yes this sad reality dawned on me much later! I'm sure 8 yr old me would've been ready with a 'fact' like: "...and so after the success of Turbo Outrun XeNTaX released Test Drive and the Need for Speed series and went onto become EA Blackbox Canada" but then history has proven me wrong! Speaking of which, I dont want to derail the topic, but i'd like to ask help on how to encode mp3s into NFS: Most Wanted's (2012) format, where would be the best place to ask that in the forum? I read the rules again but wasn't sure. Cheers again! edit: Disregard the above I found the exact subsection I needed, Thanks again ! Tried with my one email address, timed out halfway through the download and link stopped working. Tried with my other email address, got to 99% timed out at the link does not work anymore. This is ridiculous, should I now try with a third address? EDIT: tried third address, figured it out, first time because of my bad internet the download manager basically ran out of retries because of timeouts, the second time the AV kept blocking the web address at 99% and the retries ran out because of timeouts. This time I downloaded it via browser and had to disable AV, strangely enough the actual setup file does not bother the AV one bit so it must be the way downloads are scripted from your website. Last edited by rambo919 on Tue Sep 09, 2014 6:04 pm, edited 1 time in total. Edit: Works now like a charm. Thanks !!! Last edited by MultiCore on Tue Sep 09, 2014 5:46 pm, edited 1 time in total. I removed it and reinstalled it again. This time it worked fine. No idea why it didn't work the first time around. "this program requires a internet connection".... seriously?